For all readers of the UIS Chancellor’s blog, welcome (or welcome back) to the 2014-2015 Academic Year at UIS! I appreciate your participation in the life of our campus via the Chancellor’s blog and look forward to sharing lots of news, stories and thoughts about our campus and the members of our academic community throughout the coming year. 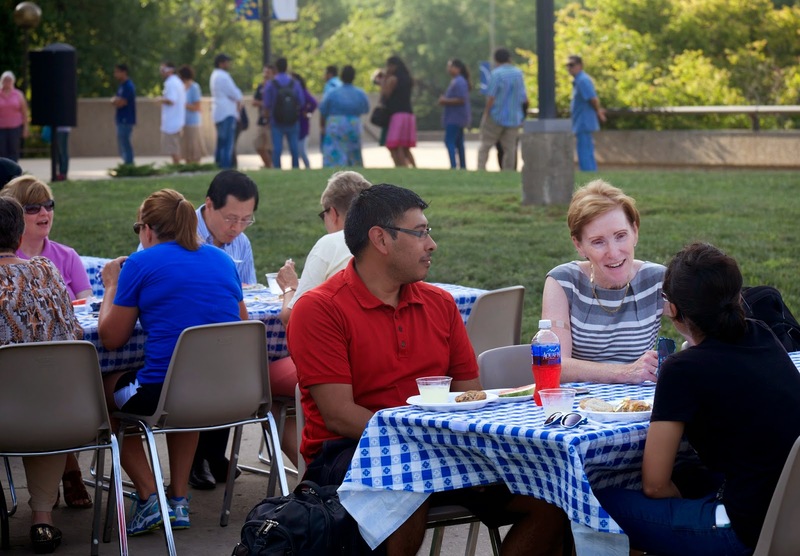 The Chancellor’s Welcome Picnic is a wonderful tradition of fun, food, music, meeting, and greeting during the first week of classes on campus. As expected...it didn’t disappoint yesterday. This gathering was my fourth serving as picnic “Host”, and the event continues to be one of my favorites of the year. I’ll grant you, at 92 degrees it was a little warmer than usual; but the heat didn’t seem to discourage the hundreds of students, faculty and staff who enjoyed the great food, awesome DJ (UIS alum Jaime Cruz) and the opportunity to get together for enjoyable conversation. The crowd was large and energetic ….. and grateful for the option to sit either outside and enjoy the music or inside where the temperature was at least 20 degrees cooler. I had a great time walking around and talking with so many students and staff – many of whom are new to our campus this year. Thanks everyone for joining us for this annual campus tradition and best wishes for a productive and enjoyable year!